Cycling Cross Country National Championship. Photo by Cathy Batten. 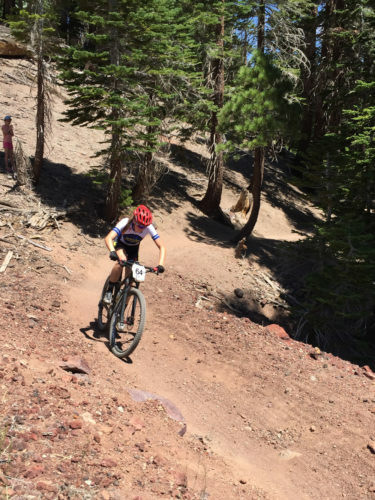 Utah Riders took home 11 national titles in the 2015 Mountain Bike National Championships held from July 15-19, 2015 in Mammoth Lakes, California. Utah riders results are highlighted below. Joey Foresta, 1st Place, Downhill Junior Men 9-14, Dual Slalom. Bryn Bingham, 2nd Place. Katie Clouse took Gold medals in both the Junior Women's 13-14 Cross Country and Short Track Cross Country events. Tom Noaker, 1st Place, Cross Country Masters Men 65-69. Keegan Swenson's coach, Noaker writes, “I won my first national title at Mammoth nearly 20 years ago (45-49), so it was motivating to repeat two decades later and then watch Keegan take Silver in the elite pro race.” Dwight Hibdon, 2nd Place. Joel Quinn, 1st Place, Cross Country Masters Men 70+. Ellen Guthrie, 1st Place, Masters Women 55-59. Zan Treasure, 1st Place, Cross Country Masters Men 55-59. Kelly Crawford, 1st Place, Cross Country Masters Women 50-54. Keegan Swenson, 2nd place, Cross Country Pro Men. Cross Country Pro Women – Evelyn Dong 10th Place, Former SLC'er Emma Maaranen, 12th Place, Nicole Tittensor, 16th Place. Cross Country Masters Men 60-64 – Mark Enders, 2nd Place. Cross Country Junior Men 13-14 – Skylar Patten, 2nd Place. Cross Country Junior Men 15-16 – Connor Patten, 3rd Place. Cross Country Junior Men 17-18 – Anders Johnson, 2nd Place. Find complete results at http://usacycling.org/2015/mountain-bike-nationals.